In the most recent issue of the Sand Lake Hills Newsletter put out by the Sand Lake Hills Homeowners Association, Inc. (SLHHOA), local real estate agent Paul McGarigal has decided to contribute a "real estate update" for the residents of the Central Florida community, but I question the motivations behind an article written about real estate and home sales by a real estate agent for a publication put out by a homeowners association - especially an association embroiloed in a lengthy and costly legal battle with a neighboring resident and an agent who represents many properties in the area. 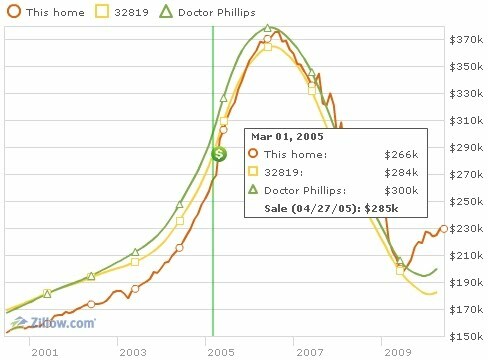 I'm constantly asked by people living in the Dr. Phillips area... "how much is my house worth" and "is now a good time to sell?" My mission in this article is to clarify the "worth" part of the question. The easiest way to explain this answer, from a "non-emotional", "educated" and "experienced" way, is to try and explain how the appraisal process works. You see, as a buyer or seller, sooner or later in the sales process, the appraisal will come into effect. As a seller, you of course want "top dollar" for your house. As a buyer, you want either a "good deal" or a "remodeled/perfect" home. But again, the buyers and sellers expectations will be contingent on an appraisal being equal to or greater than the agreed sales price. I have never, in 25 years of selling over 2,000 houses - had a buyer pay more than the appraised price (I'm sure it has happened in .001% of all sales). I have had many contracts (as an example) listed at $249,900, offered and accepted at $240,000, then appraise at $215,000. In most contracts for purchase, there is a financing clause - making a sale contingent on receiving an appraisal equaling the sales price. If it doesn't then either party may renegotiate the sale price or even cancel the deal. Honestly (sellers put youtself in the buyer shoes), you see 10 houses, you pick the one you want, you make an offer such as the example above, and after being accepted, the approval from the bank doing the mortgage is contingent on the appraisal. So you offer $240,000, and the appraisal comes in at $215,000 - would you realistically pay an additional $25,000 down payments to buy this house? I have a problem with where McGarigal is going with this. First, I would have to say that his position is not without bias - he owns property in the surrounding Sand Lake Hills sections as well as the other local neighborhoods. While he is an experienced real estate agent with years of experience, he has been involved with the SLHHOA for years, donating money for their pet projects, like renovating county right-of-ways that the association claimed was their own "common property," doing all this in the name of property values. Keep in mind that this is the same guy who wrote a couple years back in a newsletter for another local neighborhood newsletter, one in which he was the president of, and one with comparable prices to Sand Lake Hills, that in 2008 Florida home prices hit bottom and that people needed to preserve the sky-high prices of the boom. 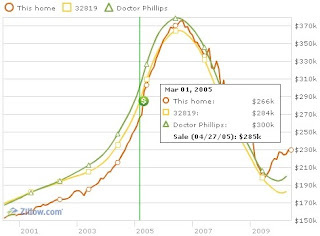 Was McGarigal suggesting that sellers somehow retain inflated home prices? If you consider the price of the home he owns in Sand Lake Hills has dropped almost half in value in just three years time (McGarigal purchased his property towards the height of the boom), McGarigal would seem to be coming at this issue from an emotional standpoint. McGarigal claims that in his 25 years in the business, never has he had a buyer pay more then the appraised price, although he pulls some number (.001%) out of thin air for frequency of such transactions. I am again reminded of his property in Sand Lake Hills. McGarigal purchased the property in 2005 for $285,000. According to Zillow, McGarigal himself purchased the property in Sand Lake Hills for almost $20,000 more than the estimated value - presumably as an investment since it is not his homestead. 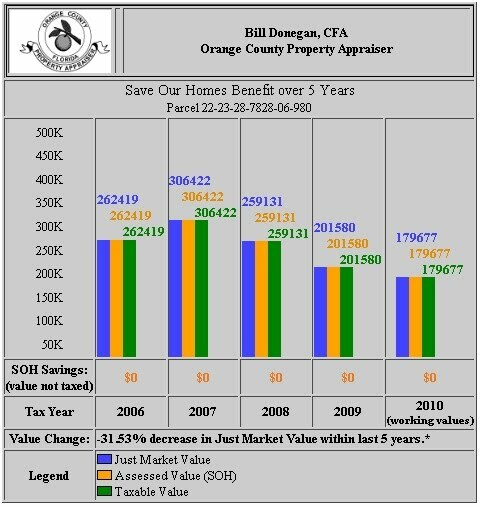 According to Orange County Property Appraiser, McGarigal's property did not top his purchase price until 2006/2007. Maybe Paul McGarigal doesn't include himself when he stated that he never "had a buyer pay more than the appraised price" or maybe he was just part of that .001%. Obviously Paul McGarigal is a pro-HOA kind of guy. He's been one of SLHHOA's biggest benefactors, been part of the Dr. Phillips Preservation Association (a sort of who's who of Dr. Phillips HOA leaders), and has written numerous articles discussing property values and HOAs. This instance is no different then before, and there is something Paul McGarigal doesn't tell the readers in his article, and that is regardless of property values, if McGarigal sells the property, he gets a cut. His support of associations is because HOAs claim to raise property values, which mean every property McGarigal represents can potentially net a greater profit. That is why real estate agents such as McGarigal write articles on how to buy and sell properties, and publishing letters in HOA newsletters is just preaching to a captive audience. McGarigal encourages buyers not to wait, but tells sellers to give it a couple years so that this recent slump in housing sales (called the burst bubble) won't affect their property values, because sale prices today would be too old to be used for comparable figures in the future. And if that wasn't enough, McGarigal puts an advertisement at the end of his article promoting his Rent Now Buy Later Program and offering complimentary coaching sessions to potential sellers. This increased mingling of real estate agents and homeowners associations is unethical. There is nothing wrong with certain relationships between the two but McGarigal has blurred the lines, blatantly misrepresenting his role in the neighborhood and using the HOA as a podium to present his business to the residents.